14th July 2017 | filed under Face. Acne is caused when hair follicles become blocked and the sebaceous gland produces too much oil. Acne commonly occurs in teenagers, but it can also affect adults. As acne can be incredibly difficult to get rid of, it can be frustrating and upsetting for those who suffer from the condition. In fact, it can even have lasting physical and psychological effects. Even after acne has subsided, sufferers can be left with unsightly, and often conspicuous scars. This can be upsetting as the skin can be left with large craters or deep holes despite the fact that the acne has cleared up. It can be tempting to pick at acne spots, but this can lead to infection, one of the many unpleasant effects of living with acne. If the skin becomes infected, sufferers may experience pain and discomfort until the infection is gone. This can then lead to worse scarring which then has its own negative effects. It can be common to find yourself lacking in self-esteem when suffering from acne, or if you have been left with acne scarring. This can lead to people becoming withdrawn and struggling with social interactions, leading on to other psychological issues. There are plenty of myths attached to acne, so some people find that others can misunderstand their condition and even be unkind. Some people may believe that acne is a result of a lack of hygiene or cleanliness or even believe that it is infectious. This can be frustrating and upsetting as it can have an effect on the way people interact with those who suffer from acne. Each effect of acne seems to have a chain which can lead on to more serious issues. For example, a knock to self-esteem can lead to anxious feelings, which can cause a sufferer to be more likely to take sick days from work or school. This can then lead to feelings of anxiety when returning and may lead to social withdrawal. In turn, these things can turn into more serious issues and can even result in an increased risk of anxiety and depression. At Aesthetic Skin Clinic, we offer a number of treatments that can help to improve acne scarring and acne. 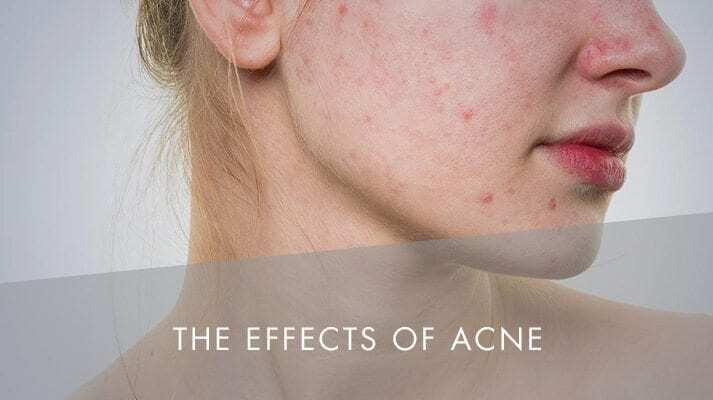 These treatments can help to improve the physical impact of acne and its scarring, but you may also see a huge improvement in the psychological effects as well. We hope to be able to give you confidence back when you come to Aesthetic Skin Clinic for acne treatments. If you would like to find out more about any of our treatments, please don’t hesitate to get in touch with a member of our team, and we would be more than happy to help.